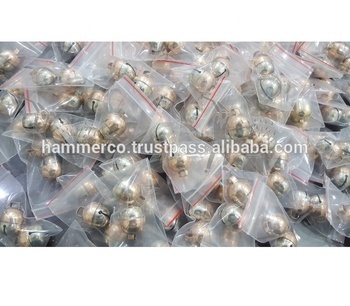 NOW TRACK YOUR PETS EASILY USING EXCLUSIVE HAMMERCO HANDMADE COPPER BELLS, LOUDER THAN YOU KNOW!!!! Is missing pet a common problem for you? Or, do you always have to search for your pets? If the answer to any of the questions is yes, then you need to get the Falconry bells for your dog or cat. The bells are made of copper with stainless steel motion clapper that produce ringing sound at the slightest of the movement which helps you easily locate your pet even when they are yards away. HAMMERCO Bells are handmade using high-quality copper and stainless steel that allows louder ringing sound to keep a track on your pets, yet not too loud when close by to be a bother. Also, the ringing of the bells does not bother the pets as well, they often get accustomed to the sound. You can now be relaxed knowing exactly where your pets are even when you are outside the house. The familiar movement pattern has helped pet owners to differentiate between pets just by the sound coming from the bells. Pets like dogs and cats are way too adept at killing squirrels, birds or small wildlife; which can turn your backyard into a massacre scene. HAMMERCO Bells allow sound off to the prey giving it enough time to make an early escape. Each bell pair configures into a tonal variation and comes supplied with a stainless-steel split-ring which can be easily attached/detached to your pet's collar. HAMMERCO bells are the appropriate size for both cats and dogs and allow perfect sound quality, pitch, tone, volume, and durability.